The kidneys perform the vital function of filtering waste materials out of the blood. When the kidneys stop functioning, a person can die quickly from waste buildup. As early as 1861, Scottish chemist Thomas Graham (1748-1843) described a procedure he called dialysis to purify (clean) the blood in case of kidney failure. The blood was spread across a membrane (a thin covering that forms a layer over or between objects and organs) that allowed wastes to pass into a balanced fluid, while replenishing (restoring)substances would pass from the fluid into the blood. Practical application of dialysis was developed by John Jacob Abel, the first professor of pharmacology (the study of drugs) at Johns Hopkins University School of Medicine in Baltimore, Maryland. In 1912 Abel was investigating byproducts in the blood. He needed a device to extract these materials from the blood. With his colleagues Benjamin Turner and Leonard Rowntree, Abel built the first functioning dialysis machine. This machine circulated blood through celloidin tubing immersed in a saline (salt)-dextrose (a type of naturally-occurring sugar) solution wrapped around a rotating drum. Urea (a solution found in urine) and other toxins passed out into the solution and oxygen passed into the blood. Abel called the process vividiffusion, and tested it on rabbits and dogs. Abel, Turner, and Rowntree published their findings in 1914. The major problem with dialysis in its early days was the tendency of the blood to clot (thicken) while circulating in the machine's tubes. Abel used hirudin, an anticoagulant (anti-clotting agent) obtained from leeches, to prevent clotting. Once hirudin was widely available, dialysis became clinically useful. Several researchers developed more advanced dialysis machines during World War II (1939-1945). The need for such machines was urgent because injured soldiers, as well as civilians pulled from the wreckage of bombed buildings, often died from acute kidney failure. Willem Kolff, a Dutch physician, became interested in saving kidney-failure patients in 1937. Working in Groningen, Holland, Kolff soon put together a crude dialysis machine and worked to refine it. When German troops occupied the Netherlands in 1941, Kolff moved to Kampen. In spite of wartime shortages, he constructed a dialysis machine using cello-phane tubing and beer cans. Kolff first used his device on a human patient in March of 1943. Although only one of the 15 patients he treated from 1943 to 1944 survived, Kolff persevered. By the time World War II ended, Kolff had refined his machine. He began to promote its use, bringing dialyzers to The Hague, Amsterdam, and London, England. In 1947 Kolff traveled to the United States to promote the use of his machine. He gave the blueprints of his latest invention to doctors at the Peter Bent Brigham Hospital (attached to the Harvard Medical School in Boston, Massachusetts) and explained the technique he used. The doctors included John Merrell, Karl Walter, and George Thorn. The trio made kidney dialysis a standard treatment for kidney problems. They also used dialysis to support patients in their pioneering development of kidney transplantation in 1954. Dialysis made the transplanting of kidneys possible by keeping patients alive until their new kidneys started to function. Dialysis also maintained patients whose kidneys had failed until a donated organ became available. 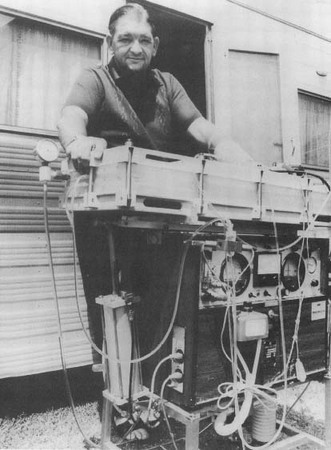 In 1973 Ronald Bell of West Australia took part in a three-month experiment that kept him alive on a mobile kidney machine. Bell spent thirty hours a week hooked up to the device, mostly while sleeping, and still managed to supervise his cattle business. designed a Teflon and Silastic shunt. The shunt consisted of two parallel tubes with a U-connection that could be inserted into a patient's artery and vein and left in place for months or years. In 1966 the fistula was developed. The fistula is an internal surgical connection of an artery with a vein. Abel and colleagues did not use a rotating drum. They laboriously made tubing from celloidin and attached them to a complicated glass manifold. THey removed aspirin from the blood of an experimental dog. The first rotating drum was invented in the Netherlands during WWII by Willem Kolff, who performed the first practical hemodialysis in humans. This is inspiring. I am so happy I picked this topic for my biology project. please advise if artificial kidney implantation is now available to patients? thnx.